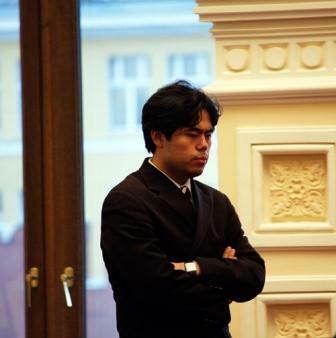 Sergey Shipov was again providing an express report for Chess-News. You can play through the games in the viewer at the end of the text. 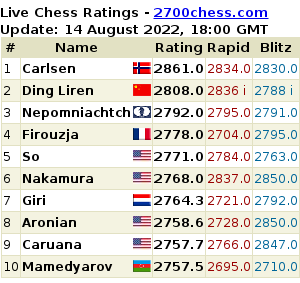 My respect for the Chinese grandmaster is growing by the day in geometrical progression. The guy has turned out to be not only talented, but also a quick learner. It’s terrifying to imagine what sort of giant he might become in five years or so. Today Ivan (allow me to extend his name like that – translator’s note: in Russian he’s usually “Van”) achieved a fully-deserved victory, the logic of which wasn’t reduced by the fact that his opponent… resigned in a drawn position! But let’s take things in turn. Boris played the opening fine and should have equalised without any trouble. Out of the many convenient moments I’ll note the simplest: 18…c5! (instead of the insipid 18…Rab8) 19. dxc5 Nxc5 20. Nxc5 bxc5 – after which the activity of Black’s bishops compensates for the weakness of the c5 pawn. Moreover, the backward pawn on b2 is hardly a jewel in White’s position. After that Ivan skilfully applied pressure in a slightly better middlegame (I really liked 34. h4! 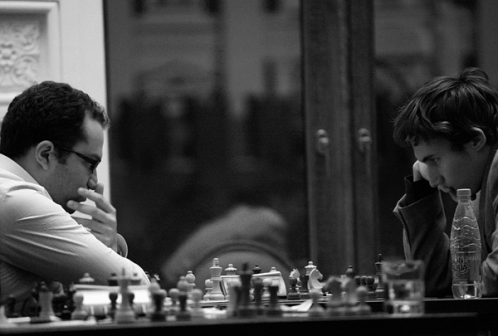 – only a top-class player can make a move like that), and then a slightly better endgame. It’s not his fault that the drawing tendencies of chess are so great. After a brilliantly conducted game he got a position which looked lost for Black, but which was in fact drawn. Clearly by that point Boris was simply tired and had collapsed mentally. If he’d been fresh and alert then instead of resigning the game he’d have played 75…Ke6 and drawn easily. There might have followed 76.Rxg7 (76.Re8+ Kd7 77.Re2 Rb1 – and black stands still) 76…Rg1+ 77.Kh5 Rh1+ 78.Kg4 Rg1+ 79.Kf3 Kf6 80.Rg8 Rxg6 – with a drawn pawn ending. The Russian decided to win with small measures but didn’t manage. The Azerbaijan leader (forgive me, Radjabov) played the Grunfeld Defence proficiently and got a holdable endgame (forgive me, Russian language experts – translator’s note: Shipov uses a word that perhaps doesn’t really exist based on the verb “to hold” and the English “holdable”). Kramnik’s attempts to sharpen play were spectacular and enlightening in their way, but in the bigger picture they didn’t represent any real dangers for Black. I’ll note only the move 30…g5! allowing Black to activate his rooks. The rest was elementary. A draw was the right result. A very important game for chess theory. It seems as though the variation Shirov chose is disastrous for Black – by sacrificing a pawn White gets a dangerous initiative. It was in vain that Grischuk gave in to the temptation of playing the spectacular 21. b4 thrust. After he “won” the exchange he had to try and save the game – Black quickly coordinated his pieces and developed a threatening initiative. Instead of that White could have maintained serious piece pressure on the centre with 21. Be2! e5 22. Bg3. It seems to me that in that case Black’s position wouldn’t have been healthy. 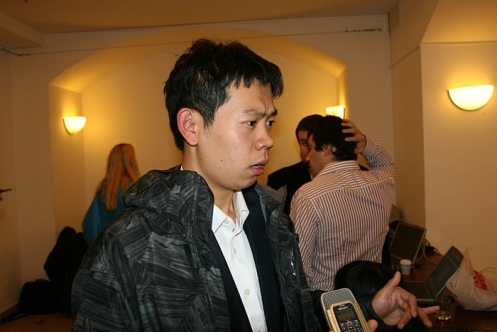 In the game, however, Shirov got serious winning chances – and let them slip with the natural move 36…Rf8. It was stronger to include 36…Qa1+! 38. Kh2 Rf8, so that after 38. Rxb7 Qxa2 the weakness of the f2 pawn would worry White. In fact we got a “4 vs 3” endgame, in which White safely drew without any problems. This game will induce black pessimism in creative chess players who don’t like cramming up on theory and look for untrodden paths. Eljanov delivered a surprise in the opening – 6. Bf4! ?, but it didn’t give Karjakin, a chess player who from his youngest years has been working with computer programs, any trouble to react strongly like a computer and obtain comfortable play with Black. * Translator’s note: Shipov’s idiom means, for obscure reasons, that they’re complete experts in it.